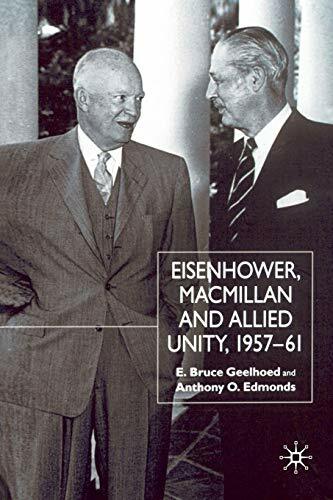 Between 1957-1961, Dwight D. Eisenhower and Harold Macmillan restored the 'Special Relationship' between the United States and Great Britain after the Suez Crisis of 1956 threatened to divide these longtime allies. Their diplomatic partnership, designed to keep the peace during one of the most difficult periods of the Cold War, was based on their personal friendship, the system of bilateral consultations which they established, and the program of defence co-operation which they instituted. In this fascinating study, Geelhoed and Edmonds explore the most important diplomatic partnership of the 1950s. E. BRUCE GEELHOED is Director of the Center for Middletown Studies and Professor of History at Ball State University. He is the author of Charles E. Wilson and Controversy at the Pentagon, 1953 to 1957 (1979) among other works. His academic specialties are the Eisenhower Presidency and National Defence Policy. ANTHONY O. EDMONDS is Professor of History at Ball State University. He is the author of Joe Louis, The War in Vietnam, and, with E. Bruce Geelhoed, Ball State University: An Interpretive History. He has also won five major teaching awards at Ball State.